A punch and chisel set would always prove to be very useful in anyone’s toolkit. Thus, investing in the best punch and chisel set is very ideal. But before buying, here are some things we think you need to know about the punch and chisel set. First off, we have Stanley’s 16-299 12 Piece Punch and Chisel Kit in our list. This small set may not seem like much. However, it is actually pretty versatile. The set includes three different cold chisel sizes and nine different punches. They are all brightly colored and ergonomically designed, making them easy to use and locate when misplaced. As expected of Stanley products, each punch and chisel is made standard quality. This set comes with a Stanley Limited Lifetime Warranty. Quality issues and factory defects are covered. However, abuse, later and/or repaired Stanley products are not within the coverage. It also comes in a very accessible packaging to easily display the items. The punches and chisels are very well made. The items in the set are made of hardened steel. The different punch and chisel sizes available in the set are very versatile and can be used for a wide range of purpose. The packing card that comes along with the kit is not the most ideal for storage and portability. The chisel set might not be ideal for super hard objects like metals or others that require extremely sharp chisels. If you’re not completely sold yet and are looking for an Alternative, Astro might be for you. The Astro 1600 16-Piece Punch and Chisel Set includes a tapered punch, cold chisels, pin punch and a center punch. The items included in the set are all made with Chrome Vanadium steel and have a hardness of 54 to 58 HRC. This model is also available in a larger size set and comes with a canvas pouch. This 16-piece set offers a wide range of applications with the different punch and chisel shapes/designs available. The heated Chrome Vanadium used for this set has a high hardness rating. This is what keeps heads from mushrooming and chisels or punches from dulling. The chisel comes with a chisel gauge for maintenance. The gauge is what shows the correct angle when maintaining chisel edges. The set comes with a pouch and a plastic storage tray. It is very cheap and reasonably priced. It might not be as ideal for professional use. It is only ideal for home or general use. You might find the plastic tray a bit flimsy. Thus, you might have to buy a better one. When it comes to budget, the Best Choice 12pc. Heavy Duty Punch and Cold Chisel Set might be for you. This brand will prove to you that a reliable product doesn’t always have to break the bank. This 12-piece set includes four pieces of pins and tapered punch as well as two center punches. You also get six pieces of cold chisels. Thus, a very versatile set for a cheap price. Most importantly, it comes with a pouch for easier storage. The drop forged and hardened chrome vanadium steel is fortified with a rust-preventative coating. This increases durability and longevity. The punch and chisel blades are very strong and precise. Through a high-frequency heat treatment, the machine sharpened tips improve strength and performance. The included canvas roll-up pouch makes for a very convenient storage. All the items included in the set are well-painted and coated. Thus, they are pretty resistant to premature oxidation. It does not come with a definite warranty coverage. The case that comes with this set is not as durable. Look for a different case or pouch that will not give you the trouble of dropping the items. We cannot emphasize enough how ideal it is to not compromise quality for the money. Nothing compares to a trustworthy set of punch and chisel. Despite the price, if the quality is good, it’ll be worth it. Which is why for our upgrade pick, we have the OTC 4600 Punch and Chisel Set. This set has 16 pieces of tools in it. It also comes with a storage tray and a chisel gauge. But more importantly, its chrome vanadium steel punches and chisels are all well-made. The length of the punches and chisels included are ideal for automotive use. The punches and chisels are hard and sharp enough. All of them are very well-made. You can get a manufacturer’s warranty from OTC. However, you would have to contact their customer service or look into their official website. The set comes with a plastic tray. Despite being the upgrade pick, it is actually reasonably priced and not that expensive for its quality. The plastic tray is quite flimsy and might not be ideal for rough handling or storage. If you plan to use them professionally, some pieces might come off as a bit small. 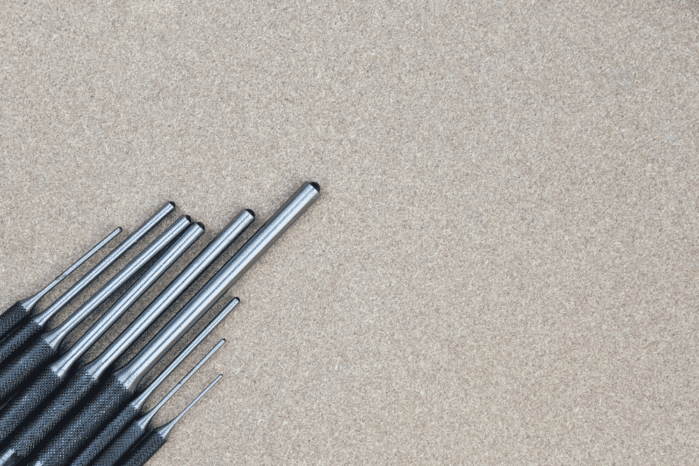 Finally, for our niche pick, RAM-PRO 16-piece Punch and Chisel Set made it to our list. This particular set is ideal for metal and woodwork as advertised by the brand. This set includes five pin punches, five taper punches, three cold punches and two center punches. You also get one chisel-punch gauge. Its non-rust, Chrome Vanadium Steel material is very sturdy as well. It has a hardness rating of 54 to 58 HRC, similar to Astro’s. Most importantly, all items are split-resistant due to their chamfered construction. The chamfered construction on the hammer striking end of all the punches and chisels make them extra durable. The chisel comes with a chisel punch gauge for an easier and smoother maintenance. This set offers a wide range of application. From marking and aligning holes to repairing or building, you can surely ace your metal or woodwork niche. All the tools included in the set have hex shafts for added strength and durability. It does not come with a warranty coverage as mentioned. Similar to some of the brands listed above, the packaging might not be as good as the set itself. The size of punches and chisels are very important depending on the usage or purpose. If you will be using your punch and chisel set for automotive purpose, do not buy punches or chisels that are too long. This is because you might have a hard time maneuvering or controlling your use of the punch or chisel. For metal or woodwork, punches and chisels with a dimension between 3 to 6 inches might do. Diameters, sizes, and shapes should also be taken into consideration. Remember there’s a wide variety of punch and chisel size or type. Durability and material are among the most important, especially if the brand you chose does not offer a warranty. Chrome vanadium steel is a very popular material used in punches and chisels in the market today. However, keep in mind that premium steel and optimal tempering is what delivers a durable punch and chisel. It is very important that the striking end does not easily chip or crack despite getting stricken. This is a very underrated factor. However, in relation to the material of a punch and steel set, the work environment is also a very important factor. For instance, if you are working in or somewhere near sparks, it is best to opt for sets made with brass. Punch and chisel sets made with copper beryllium and/or aluminum bronze would also be ideal for this type of work environment. Otherwise, you might risk your own safety by using a punch and chisel set with different material. The number of pieces in a set is not really the highlight. It only matters if you will be using your set professionally. Likewise, a huge set does not necessarily make it the better set. Punch and chisel set these days usually range from 12 to 16 pieces. However, as long as the included size and style in the set offer a wide range of application, you’re fine. These are just some of the most important factors. However, if you want to go the extra mile, the warranty is also another factor to consider. Although looking for a brand that offers a comprehensive warranty coverage is highly ideal, it is not a necessity. A really good set does not need a warranty. However, if you are not very confident, it is best to look for a warranty that covers repairs and/or product replacements. When it comes to any tools, maintenance and care are needed. No matter how expensive your tools are, without the two, they will not last long. Thus, it is important to observe proper care. Don’t forget to clean up your punch and chisel set every after use. When using the chisel, be sure not to use the chisel on anything harder than the chisel itself. This will only dull or even destroy the chisel. Do not use a grinder when sharpening a chisel. Re-sharpen your chisel using a hand file. Only sharpen the cutting edge of a chisel. Otherwise, you might damage it. Always use a proper punch and chisel holder. Using a pair of locking pliers might only result in damage and indentations on your punch or chisel. Only use the correct punch style for a specific application. Attempting to use a punch for a purpose not its own will only result in damage and risk to personal safety. If you cannot finish a certain task with your punch or chisel, do not force it. See if you are using it correctly. Whether you are using a chisel or a punch, make sure that the head should not ever be more than 3/8" larger than the head of a chisel or a punch. Do not forget to wear safety gear and/or goggles. In the end, the best punch and chisel set depends on budget, quality, and purpose. But if you don’t want to go all out yet don’t want to go cheap either, Stanley 16-299 12 Piece Punch and Chisel Kit might be your best option. It is not very expensive nor is it cheap in quality. Its versatile array of punches and chisels as well as the limited lifetime warranty gives good value for the money. But most importantly, each item in the set is very well-made. Thus, garnering its spot for the Editor’s pick. This said we hope you find this article helpful. We wish you luck in your hunt for the best punch and chisel set. Thank you for reading!